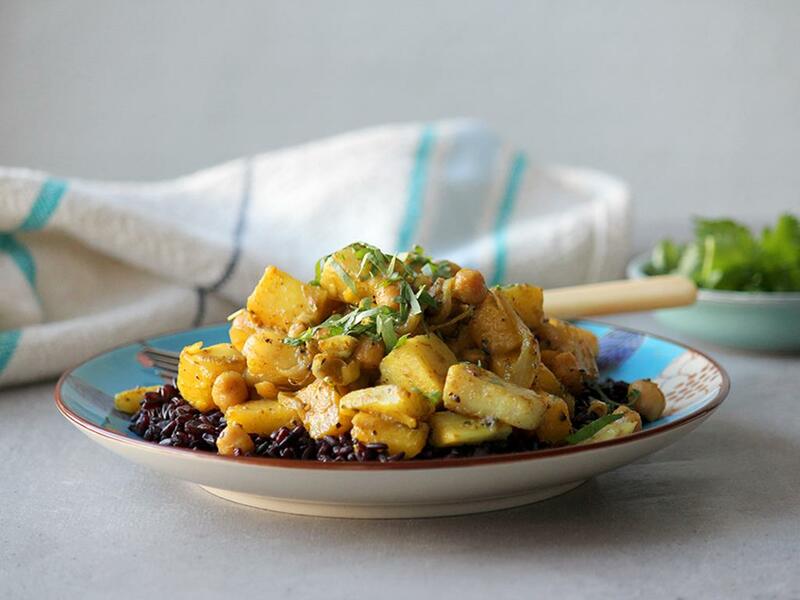 Sweet potato & butternut in a fragrant coconut, lemongrass & chickpea curry, served on a bed of black rice. Black rice: Place a pot on medium-high heat and add boiling water (2 cups for 4; 1 cup for 2) with a pinch of salt. Add the black rice and boil gently for 15-20 minutes until cooked but still slightly chewy. Drain. Fragrant curry: Place a pan on medium-high heat with olive oil (4 tbsp for 4; 2 tbsp for 2). Add the onion and cook for 1 minute, then sprinkle in the cumin. Sauté for 1 minute, add the garlic and cook for another minute. Add the lemongrass, butternut, sweet potato and chickpeas and pour in the coconut milk with water (1 cup for 4; ½ cup for 2) and season with salt and pepper. Cover and let it simmer (gently boil) for 15 minutes until the sweet potatoes and butternut are soft and cooked. If the water cooks away and the veggies are still hard, add more water (¼ cup for 4; 2 tbsp for 2) and cook for another 5 minutes. Season to taste. Serve the black rice topped with the fragrant curry and top with the fresh coriander. "Was it easy to prepare? Yes Was there enough food? Yes Were the instructions easy to follow? Yes Black rice was a bit chewy for me, maybe I need to cook it even longer?"